The town of Murphys and the surrounding Calaveras County area have numerous features that make them very attractive to visit. It’s convenient proximity to the Bay Area, Sacramento, Yosemite and the San Joaquin Valley make it a wonderful location; it is close, but still far removed from the hustle and bustle of the city. Whether it’s relaxation, adventure, shopping, dining or wine tasting, Murphys, CA and Courtwood Inn offer the perfect escape. Beyond Murphys, there are many things to do in Calaveras County. From California wine tours and golf courses to outdoor adventures such as whitewater rafting, spelunking, hiking and so much more, there is truly something for everyone to enjoy. Are you planning a trip to Murphys? 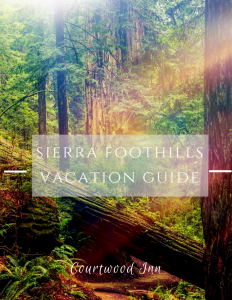 Our Vacation Guide is a great time-saving resource! It’s completely free, and contains comprehensive suggestions for everything there is to do in Murphys, CA. Download it to gain instant access to all the insider tips on the area! Below, you’ll find a sample of some of the best things to do in Murphys, CA and surrounding Calaveras County. There are several top-notch restaurants in Murphys that serve quality food. Some are easy to find on main street while other hidden gems are more tucked away. There are so many that we’ve dedicated a whole page to it—check it out to discover some of the best restaurants in Murphys, CA! What is a visit to California without incredible wine? You could spend a whole day visiting local tasting rooms and vineyards and still not visit them all. While the wine certainly flows freely, you can also find fantastic local craft beer. Below are some of the best wine tastings and breweries to be found in Murphys, CA! If you’re having trouble deciding which you’d like to visit, consider trying a wine tour! Courtwood Wine Tasting Tours drive you to select wineries throughout Murphys for a more complete wine tasting experience. There is endless beauty in Murphys, CA and the surrounding area, and there are nearly endless ways to explore that beauty. You’ll find some of the ways listed below. Courtwood Inn is centrally located near all the best things to do in Murphys, CA. Frommer’s Travel Guides has designated Murphys as “One of the Top 10 Coolest Small Towns in America.” Our inn is about 2-1/2 hours away from Yosemite Valley and many other California destinations, perfect for a day trip. Our beautiful log inn sits atop a hill that looks out over sweeping views of the San Joaquin Valley, with the Sierras rising in the distance. Each of our rooms is elegant and comfortable and features amenities like balconies, private bathrooms, luxurious linens, and more. In the mornings, you can enjoy a complimentary gourmet breakfast, and we host a daily happy hour complete with wine and appetizers. Browse our stunning accommodations and book your stay in sunny California today!